We’ve rounded up Brisbane’s best Riverfire packages that are definitely worth ditching the couch for-and won’t have you fighting crowds along the riverfront for a decent view of the fireworks. Scroll down to discover Brisbane’s best Riverfire packages for 2018. 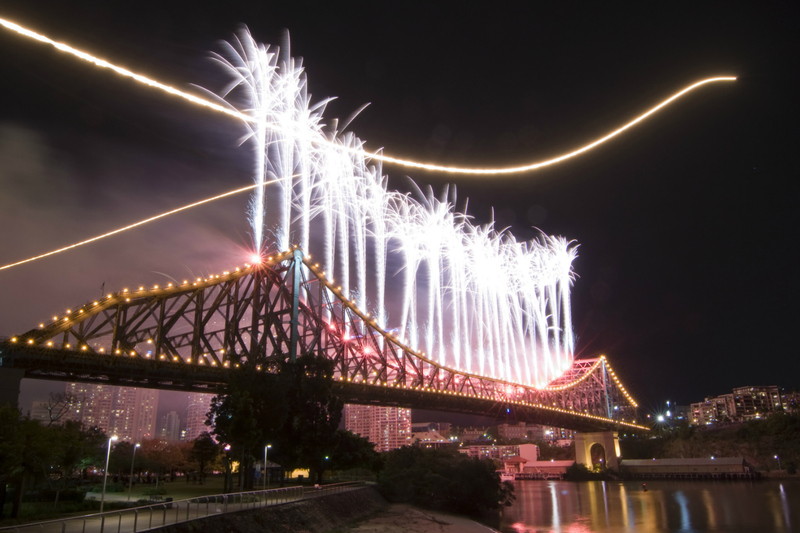 You can never go too OTT for Brisbane’s beloved Riverfire display. This year, alongside stunning front row seats to the show, guests will be able to choose from a specially curated menu by Head Chef Will Cowper. Expect the likes of Fiori di Zucchini, Tortellini with braised oxtail and smoked bone marrow filled pasta with mushrooms and parmesan. There’ll also be plenty of sweet treats and the option of a beverage package – because of course you want that. Packages start from $150pp, which you can book here. Rollin’ on the riverside never tasted so good. Il Centro will be serving a decadent Italian three course menu for Brisbane’s iconic Riverfire event, with your choice of entrée, main and dessert, as you drink in the fireworks (and a cocktail or two). Book here, or call 07 3221 6090. Here’s something to dance about. Brisbane’s signature steakhouse, Cha Cha Char, is dishing up a delicious three course Riverfire menu ’til the cows come home. For $120pp, you can land your choice of entrée, main and dessert before ending the night with a literal bang. Book here or call 07 3211 9944. Missing out on this would sting. If you’re looking for the perfect spot to watch Riverfire in Brisbane, there’s no better vantage point than Jellyfish. Settle in for a three course menu of your choice and enjoy dinner with a show. Spots start from $120pp, which you can book here or call 07 3220 2202. Waddle it be? With two spectacular packages to choose from, you really can’t go wrong. Live tunes will be the soundtrack to Brisbane’s best Riverfire package yet, as you kick back with a Swooping Magpie cocktail (seriously) and indulge in the likes of Moreton Bay bugs and lamb shoulder with pea, zucchini, squash, red onion and a mint lemon dressing. Packages start from $249pp, so book here or call 07 3556 8833. Try something new for Riverfire 2018, and by new, we mean literally fresh out the kitchen and onto the restaurant scene. Thriving Indian cuisine hotspot, Heritij, will be popping with a three hour beverage package and spicy set menu. Sit in the heart of the CBD and bite into sublime beef samosas, masala fondue, portobello beignet and much more. Tickets start from $170pp, and you can book in by calling (07) 3211 0330. Ready, Jetty, go. A four course “Feed Me” feast awaits for the whole family to enjoy. Since sharing is caring, you’ll get the best of all worlds with an array of shared canapés and entrées, and desserts, with the treat of an individual main. $135 will get you all the goods plus riverfront views, making it priceless. Book here, or call (07) 3844 8838. Pop in to Popolo for a beautiful Italian fare, a three hour drinks package and some of the best views in town. You can expect the likes of rigatoni, arancini, freshly shucked oysters and dolcettini! At the risk of developing FOMO we recommend booking on (07) 3846 7784. Celebrity chef Matt Moran and and partner Bruce Solomon have designed a decadent three-course menu, featuring a thrilling passionfruit and chocolate bombe Alaska, that will make this a Riverfire to remember. Two sittings are available on the evening of the 29th; the first from 5-7:30 for those wanting to watch the fireworks while chowing down, and another from 8pm for those who want to brave the crowds before ascending to the twice-Hatted restaurant. Bookings are absolutely essential, and can be made online here. Set your evening alight at one of Brisbane’s most beloved rooftop bars this Riverfire. With roaming canapés, mini substantials and a glass of Veuve Clicquot or ice cold Asahi Super Dry on arrival, you’ll be feeling foxy in no time. Fireworks not enough to hold your attention? The Fox has live performances and DJ’s all night long, being bored is not an option. Tickets are just $59pp and will sell out, so get it quick here. More charming than the fireworks themselves, The Charming Squire has a few Brisbane Festival specials that will be wrapping up on Riverfire night! Take advantage of meal deals including the catch of the day or handmade potato gnocchi with a glass of sauv blanc, or steak with a glass of shiraz – oh, and the sparkling South Brisbane views. Book a table here. By all means, wolf whistle at at the glorious riverside views you’re about to encounter. Pig ’N’ Whistle offer a relaxed option for Riverfire, where you can simply go, choose your favourite dish, grab a brew, and kick back as the sky lights up for your entertainment. Call 3832 9099 to book your table. It’s hard to imagine a more primo spot to enjoy Riverfire from than Riverbar, and sure enough, they’re coming through with a package hotter than the tail of an F-111! Their three-hour package from 6-9pm includes drinks, canapés, live DJs, and an absolutely unparalleled view of the big show, all for just $99 pre-booked or $110 at the door. Fireworks are beautiful, but let’s be real, everything’s a lot prettier with a drink in your hand! We can’t wait to celebrate Riverfire 2018 in Brisbane!